On December 17, 2018, Ambassador Liu Xiaoming presented the first biometric visa issued by the Chinese Embassy and Consulates in the UK to Sir Christopher Pissarides, the Nobel Prize winner in economics and Professor of the London School of Economics and Political Science. Ambassador Liu congratulated Professor Pissarides on his being the first to obtain the biometric visa issued by the Chinese Embassy and Consulates in the UK, thanked him for his effort over the years in promoting China-UK cooperation and enhancing the friendship between the people of the two countries, and hoped that he and his family will have pleasant stay in China. Ambassador Liu said that in accordance with Chinese laws and regulations and based on the principle of reciprocity, the Chinese Embassy in the UK began to issue biometric visas to applicants as of this date. This is a new measure for China to adapt to the new trend of international visa technology and further improve the visa service. The Chinese Embassy and Consulates in the UK are ready to continue to provide good service to and strong support for the people-to-people exchanges between the two countries. 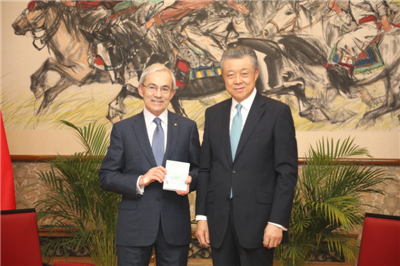 Professor Pissarides thanked Ambassador Liu for issuing the visa to him on behalf of the Chinese government, saying that he and his family were honored to be the first recipients of the biometric visas in the UK. He happily recalled the talks with Premier Li Keqiang, which he attended with other foreign experts on the eve of the Spring Festival in 2016 and briefed the Ambassador on his participation in the development of Xiongan New Area in Hebei Province and Daya Bay in Guangdong Province. He said that having a long-term visa would make it easier for him to visit China for his exchange programme. 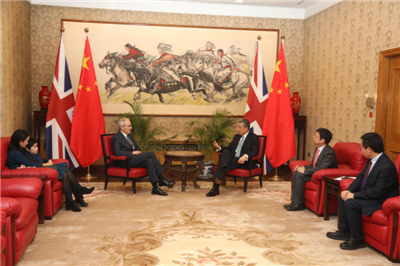 He would continue playing an active role in promoting UK-China cooperation. In accordance with Chinese laws and regulations and based on the principle of reciprocity, the Chinese Embassy and Consulates in the UK will collect fingerprints of visa applicants including British citizens from November 1, 2018, and issue biometric visas from December 17.